Both were very well done but also very depressing. I learned that Cambodians call the Vietnam War ''The American War'' and that the genocide was the aftermath of the war. I also learned that the United States dropped over a half a million ton of bombs over the country in the early 70s, a fact many Americans might not know.These bombs along with the land mines laid by the Khmer Rouge have led Cambodia to have one of the largest disabled populations in the world. Tuesday was International Human Rights Day. It is a public holiday and a lot of offices were closed, including ours. 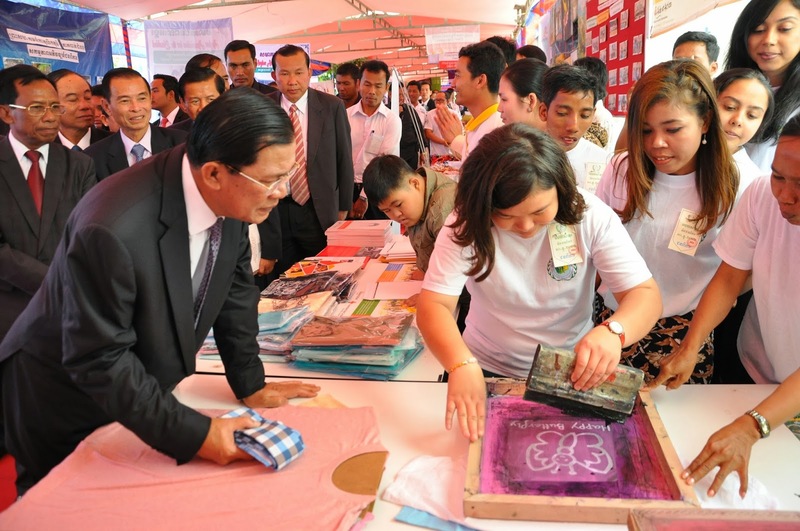 However, it was also the day the Prime Minister celebrated International Day of Disabilities. Aide et Action was invited to participate in the government sponsored event because we have a few projects aiming to educate and empower kids with disabilities. The Prime Minister spent 15 minutes with us and seemed to be really interested in our organization and the work we do with children. It was refreshing to see a lot of the locals taking an active part in this event. Aide et Action also held a week long finance workshop this week. Employees from Europe, Asia and Africa came to participate. I did not participate in the workshop but met a few of the participants during one of the sessions. This doesn't happen very often but I met another woman named Sabine! We got to know each other a little bit and she was proud I made the decision to come to Cambodia. She shared that her husband is currently looking after their three kids while she is away for three weeks. She reminded me that there is no reason to feel guilty for following my passion. She also said I was lucky to have found a man that understands and is a modern day husband. I couldn’t agree more! I met a few more people this week through Jenny and Gareth. Gareth is an old classmate from my Master’s program and he also works with me at Aide et Action. Both have been a great resource. It’s always interesting when you meet new people because one of the first questions you get is, ''how long are you here for?'' The expats that are here long term are a little hesitant to invest in new friendships with people that are going to leave fairly quickly. It is a constant revolving door of people here so I can partially understand their thought process. One of the people I met, Jan, arranged for a tour of a local Wat with a former monk. Wat is the khmer name for a pagoda. Jan is from the Czech Republic and works with UNAids. I asked if I could join him on the tour and off we went yesterday with another expat from the Czech Republic. The tour was fascinating! 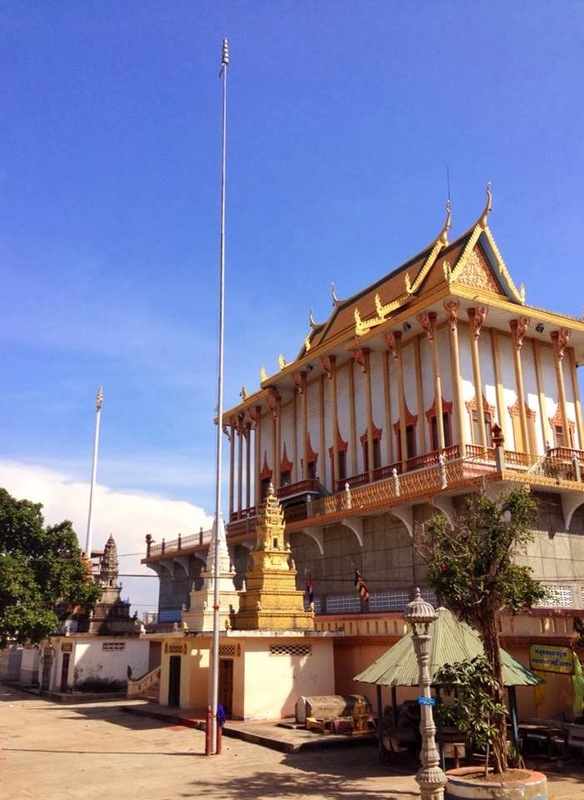 We visited Wat Nearkravaan, the most revered wat in Phnom Penh. We learned about the life of Buddha and the stories about him that are painted on the walls of each temple. We also walked around the compound and learned about the life of a monk. We got to speak with two monks and learn about their daily routine. It was great to have an open dialogue with a local. I am learning so much and am so thankful to have this experience. I am, however, not enjoying all the mosquito bites. I seem to get a new one each day and if I am lucky maybe four or five in one sitting. Maybe they just like new blood? On a completely different note, we got the house! We closed on Thursday and Asghar moved in yesterday with the help of our wonderful friends. To celebrate, I bought two paintings for our new home and can't wait to bring a piece of Cambodia back with me.